2010 was a monumental year for the Catholic Church and for its Shepherd. We saw Pope Benedict’s five International voyages, one “insider” exclusive papal Q & A released in book form, painful abuse scandal exposés, the first Canadian male saint, an Irish apostolic visitation and martyrdoms in the Middle East. All of these are just a few of the signposts that will forever mark 2010. This week, S+L producers Kris Dmytrenko, Matthew Harrison and Alicia Ambrosio (S+L’s Vatican correspondent) join host Pedro Guevara Mann to offer their reflections on the past year and their hopes for 2011. Join us for part one of two episodes of our year-end review. 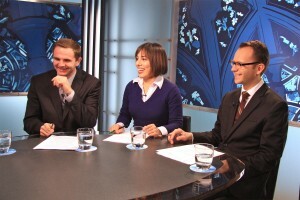 That’s the first edition of Perspectives Weekly for 2011, this Friday January 7th at 7 and 11pm ET, 8pm PT.